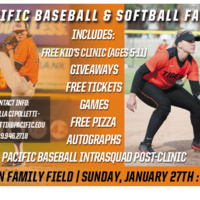 The University of Pacific baseball and softball teams welcome all families and friends for a day of fun. The two teams will be hosting a free sports clinic open to the public for kids ages 5-11 at Klein Family Field (weather permitting). The first 125 children who sign up will be able to participate in the event. Following the sports clinic, the men's baseball team will compete in an intrasquad scrimmage on Klein Family Field. The scrimmage is open for anyone interested in watching. Both squads will be having giveaways and signing autographs following the intrasquad friendly. Free pizza will be included as well. Each participant at Fan Fest will receive two ticket vouchers for two baseball and softball home games this upcoming 2019 season. Each ticket voucher will be good for any home game during the season. Be part of the action today and sign up here! All participants must fill out a waiver upon arrival for the clinic. For more information regarding this event, please contact Gabriella Cipolletti at gcipolletti@pacific.edu or (209)-946-2718.